Writing helps stress in several different ways. If you're a frequent journal user, you know the powerful effects of writing down your problems. If you've never used writing as a something you can do for stress relief, you may want to try out this simple and effective exercise. Writing can help you cope with stress, anger, and depression. Using it as part of your daily routine can be an important part of your overall stress reduction strategies. Writing down your problems can help you manage your stress in many different ways. First, the simple act of sitting down in a quiet place to collect your thoughts can have a positive impact on your mood. Getting away from stress triggers in your life, be they situations or people, can greatly improve how you feel. 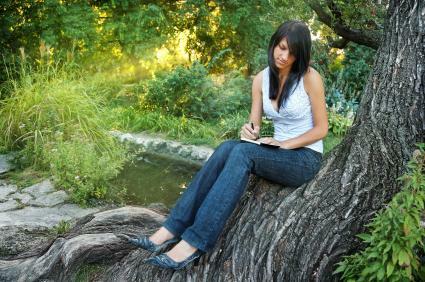 Even if it's just for a few minutes a day, you should carve out time to sit down and write in a journal. Writing helps stress by giving you a bird's eye perspective of your problems. When you are feeling overwhelmed you may look at all of your problems and think that they are too big to be overcome. This can cause you to feel even more stressed and overwhelmed. When you sit down to write in your journal, you can look at your problems from a different perspective. You'll gain insight on how you manage your problems which can help you in the future. When you write in your journal, you can express your feelings about your stress. This process can help you see your stressors in new ways. As you begin to write, you'll realize that the things that you were stressed out about weren't all that problematic. You may also find a solution to your problem as you write about it. It's similar to what happens when you talk to someone about a problem. You often talk yourself into the solution simply from the experience of having someone listen to your problems. The difference with writing is that no one will judge you or criticize you for the way that you are feeling. A journal is the ultimate neutral party. You can write as angry, as sad, or as frustrated as you want to and you won't be inhibited by someone else listening in. Writing in a journal helps you release all of the stress and emotions that you've been holding inside. Once you start the practice of writing down your problems, you'll find that the act of writing will be like a release of built up pressure. Even if your situation hasn't changed dramatically in the fifteen minutes you took to write the entry, you'll walk away with a weight lifted off your shoulders. If you are used to keeping a daily log of your events, you may have to make some adjustments to get begin writing for stress relief. These are two very different forms of journaling. When you journal for stress relief, you'll be expressing your emotions and perspective instead of cataloging what you did on a certain day. It's an emotional catalog of your day rather than the experiential catalog. By using writing prompts and getting into the habit of writing in your journal, you'll have an effective way to relieve stress that is easy to do anywhere, anytime.